The 2010 South East Sussex Branch London pub crawl was to North London and organised as usual by Pat Higgins. We met at the Bree Louise at Euston, although the Eastbourne members had met earlier at the Willow Walk (JDW) at Victoria for breakfast. The Bree Louise, an open plan, single bar, corner pub had its usual good selection of Dark Star beers on gravity as well as several others on handpump. Beers included Dark Star – Sunburst and Sambrooks – Junction. After a couple....well we had to wait for any possible latecomers...and there is a 50p a pint discount for CAMRA members...we made our way to the London Underground for the tube to Hampstead. 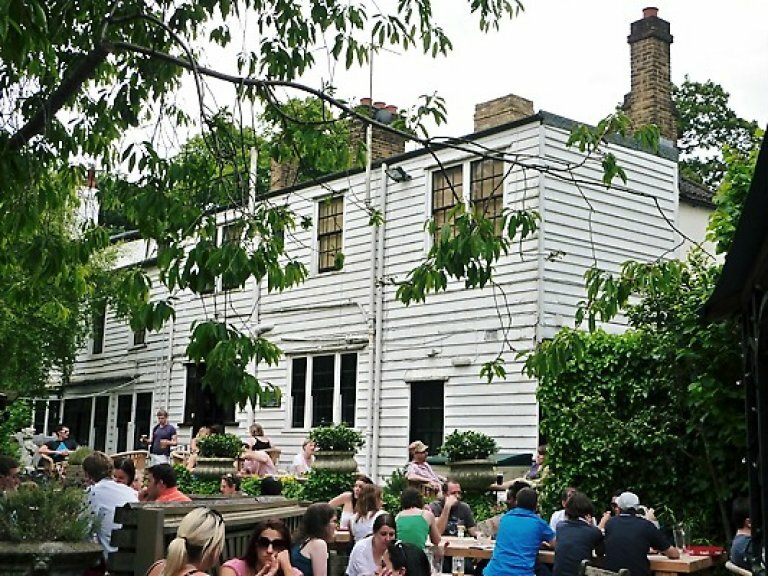 After a short uphill walk from Hampstead we found ourselves at the Holly Bush, a multi-roomed listed building full of atmosphere and character, which is also listed on CAMRA’s London Regional Inventory of Historic Pub Interiors. Beers available here included Fuller’s London Pride and Discovery. 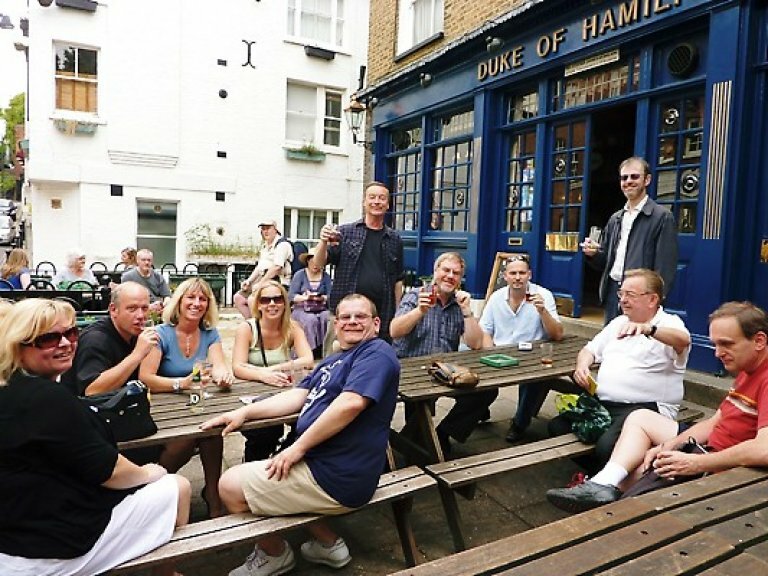 Some members made a short 50yd detour to the Olde White Bear during the stop at the ‘Duke’but we all managed to leave together, only to split up shortly after, with some members walking over Hampstead Heath to the Spaniards Inn and themore sensible members catching the bus. The Spaniards Inn has a white weatherboard clad exterior with low wooden beamed ceilings inside. The buildings date back to 1585 and are mentioned in Dickens’ Pickwick Papers and Bram Stoker’s Dracula. Most of us managed to find a small space in the very large and busy garden. Beers included London Pride (again) and Adnams Bitter. Everybody then caught the bus to Highgate where we attempted to get lunch in the Gatehouse, one of Highgate’s oldest pubs, with a building dating from about 1380 as a former tollhouse and refurbished in 1993 to include a theatre upstairs. It is now a Wetherspoons and the theatre has been retained. As our schedule was tight and didn’t fit with JDW’s estimate of a 45 minute wait for food some of us made do with a glass of Nethergate - Three Point Nine and moved down the High Street to the Prince of Wales. This proved to be a good decision as, although busy, the pub managed to serve us, fairly quickly, with some excellent Thai food, washed down with some equally excellent York – Guzzler. We then caught the tube from Highgate to Tufnell Park, where some of us foolishly walked up a large number of stairs as the lifts appeared to be a bit ‘temperamental’. Some tube tickets also continued to ‘work erratically’ but luckily we caught the barrier staff on a good day. From Tufnell park we made our way to the Junction Tavern, a Victorian pub with plenty of wood panelling and a large mirrored bar. We made ourselves comfortable in the conservatory and the large beer garden. Beers on offer included Grafton – Pocket IPA and Pot Belly – Pigs do Fly. 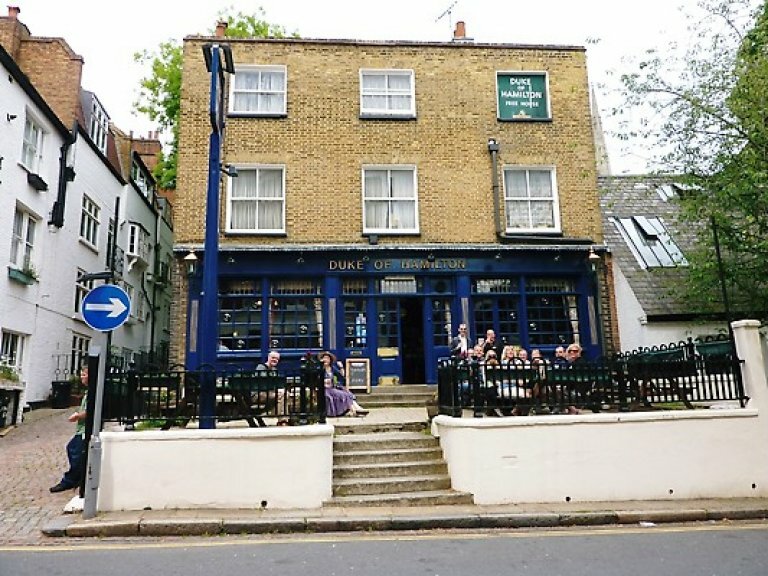 Customers at this pub recommended that as we were in the area we should try the Southampton Arms, in Highgate Road, which is fairly new but will be in future editions of the GBG. This pub turned out to be a little gem. It is advertised as an Ale & Cider House serving beers and ciders from small independent breweries. A look along the bar revealed no familiar names so we rose to the challenge and were rewarded with some very interesting tastes! Personal favourites were Marble – Beer 57 and Ascot – Alligator. I can’t remember any others as I felt very tired – I knew those stairs at Tufnell Park were a mistake!! Needless to say this was our last port of call and we made our way back to Sussex having had a very enjoyable day. Many, many thanks to Pat for organising this excellent trip and keeping us on some sort of schedule.